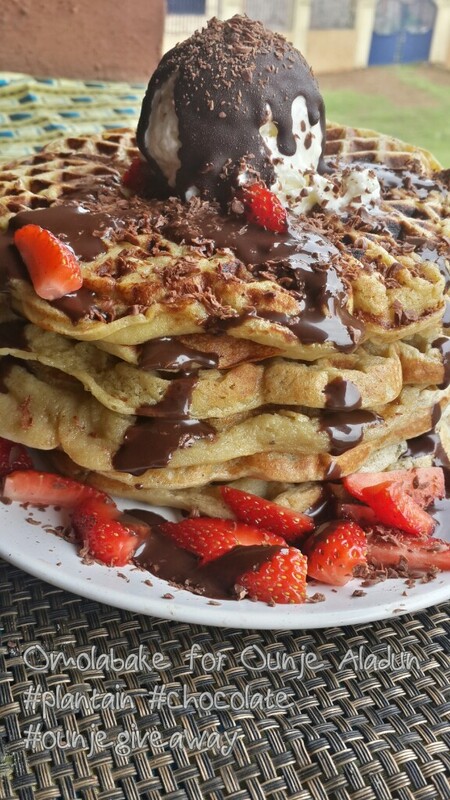 *Cooking spray or oil to coat your waffle iron. 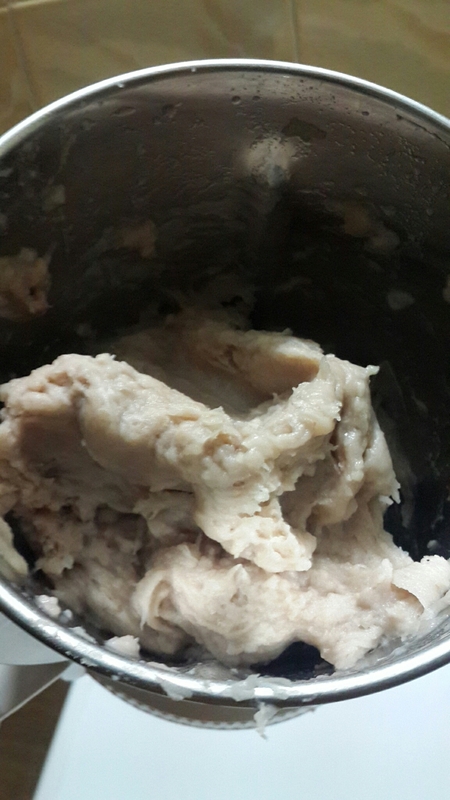 ▪ In a blender, blend the plantain and all the other ingredients to a smooth paste. 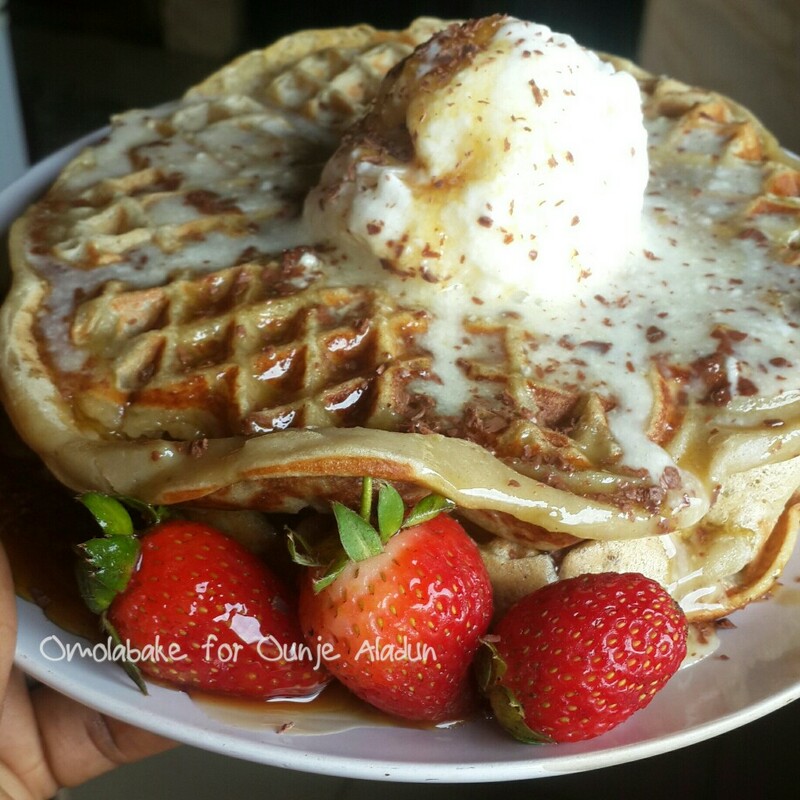 ▪ Cook till waffle iron indicator says it’s done. 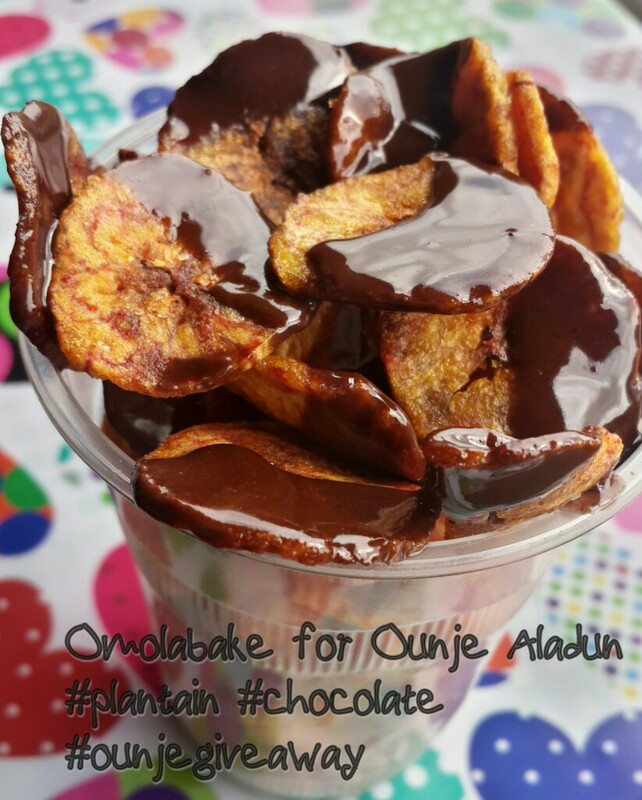 CREATE A RECIPE THAT INCLUDES PLANTAIN AND CHOCOLATE!!!!!! The top FIVE PICTURES with the highest number of likes WIN. The competition starts TODAY 29/07/2016 and ends on MONDAY 1/08/2016. 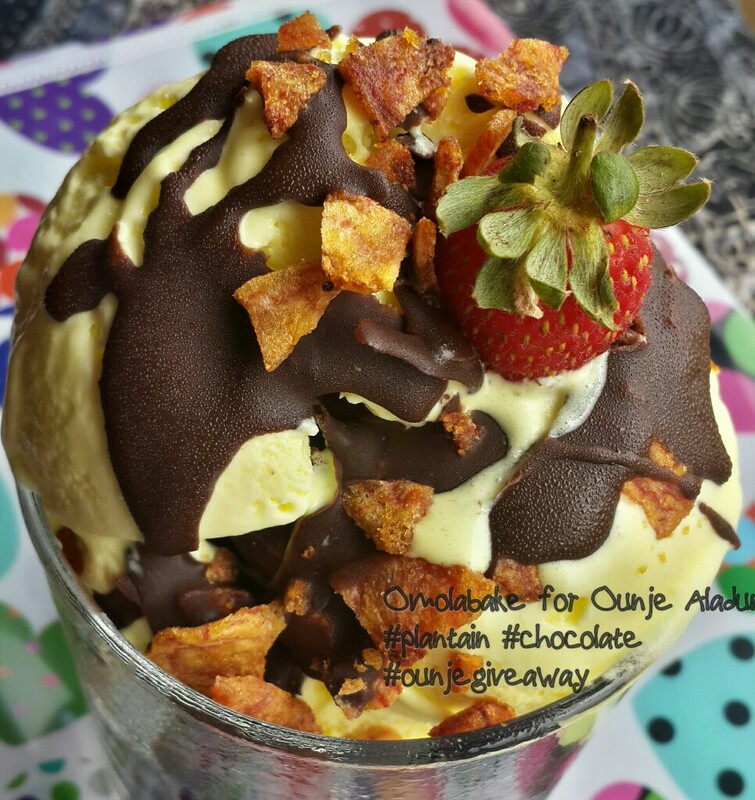 ChocBoy (The Best Chocolatey Service in Nigeria) has generously donated boxes of chocolates that would be personalised with the winner’s name. 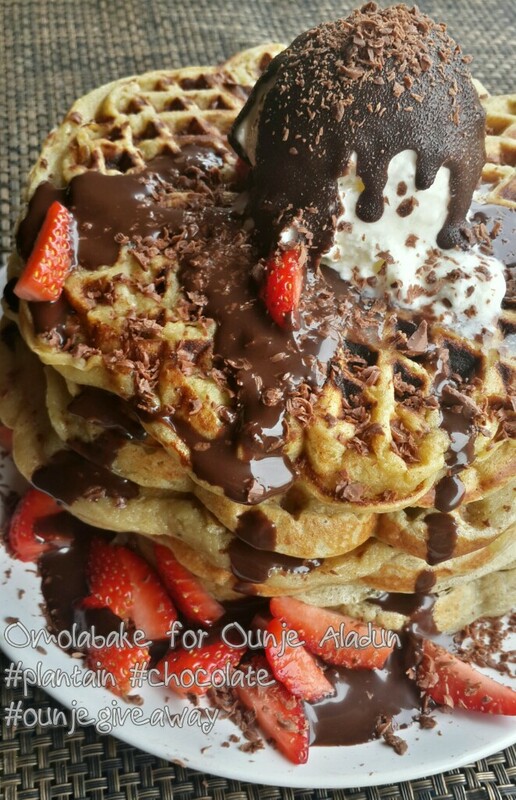 The ChocBoy Chocolatey Brand produces, packages & sells chocolate bars,chocolatey treats,chocolatey products and customized chocolate bars. 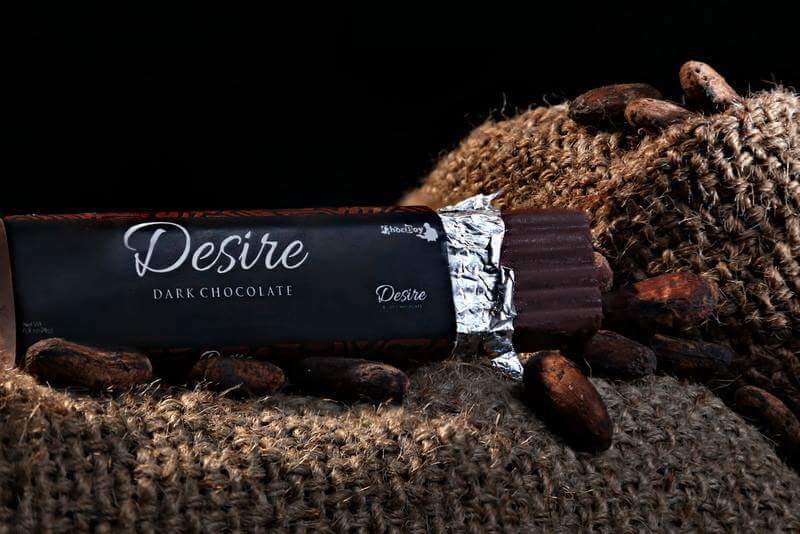 The company is an indigenous company here in Nigeria that delivers the best chocolates and chocolatey experience for you and in any event. 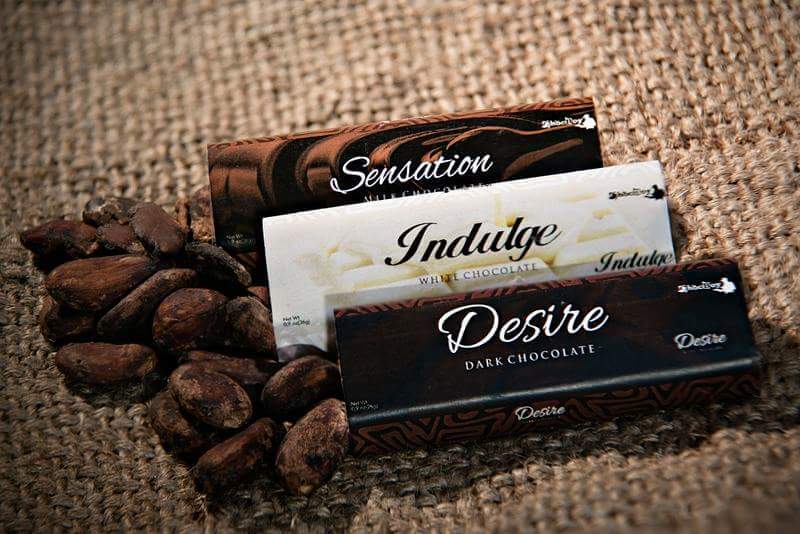 With a vision to become the preferred premium, Nigerian made chocolate brand, the mission is to produce chocolates that will give a yummy, smooth and an unforgettable chocolatey experience that keeps our consumers wanting more. Your post must contain the following hash tags. For our Facebook followers, you can still participate by sending us your entries through our inbox, we would share your pictures on Instagram and collate the votes! Shout out to @dodogang_ for the social media support. We love you!!!!! You can get inspirations for your entry from our plantain catalogue in the link below. Now you don’t have to break a leg or even rob a bank to be a part of the GIVEAWAY!!!! 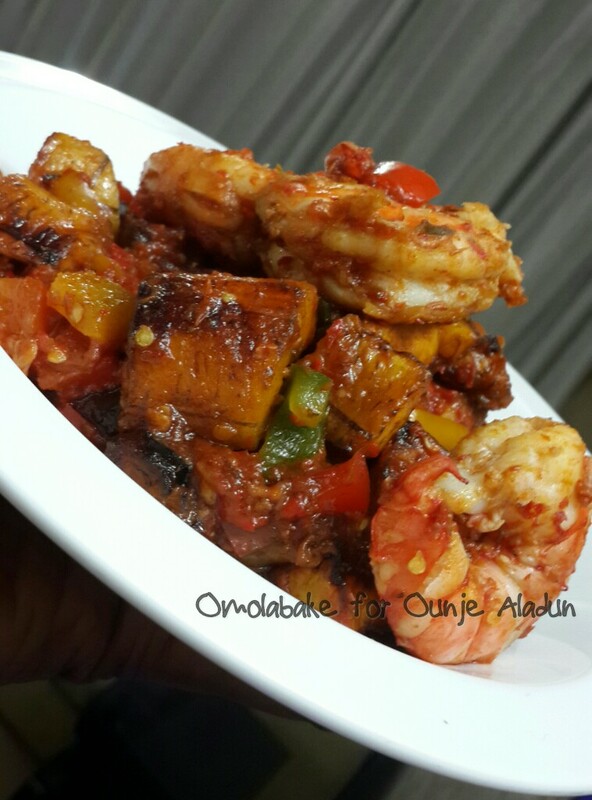 Your entry can be as simple as this, just incorporate Plantain and Chocolate into a dish. 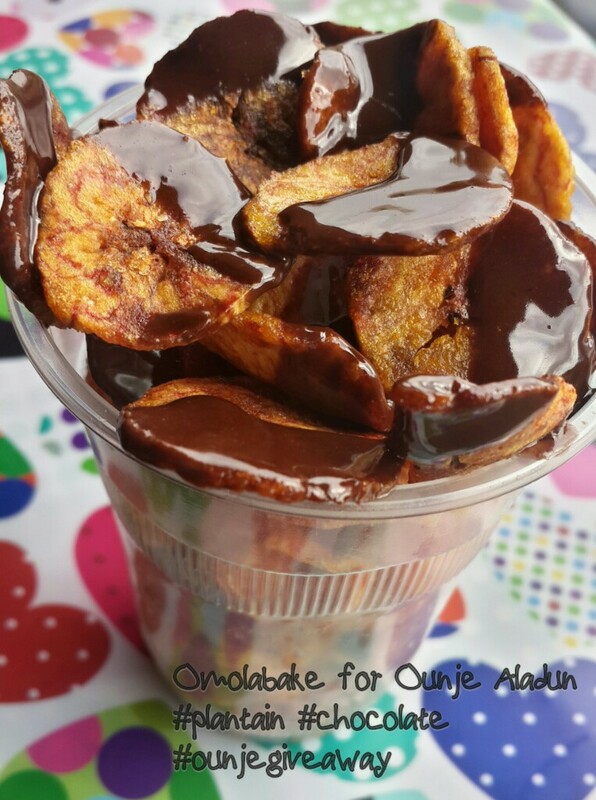 Banana Ice cream sprinkled with #Plantain chips and #chocolate syrup. 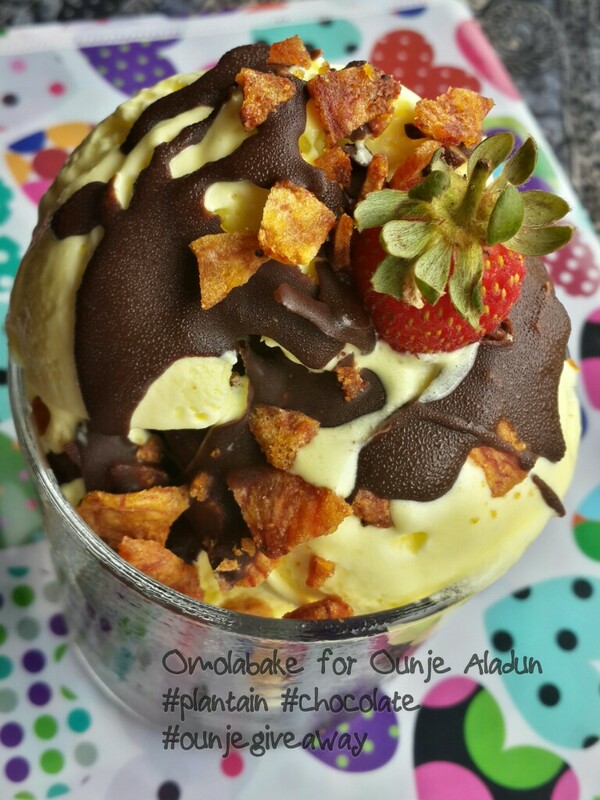 This right here is Banana Ice cream sprinkled with #Plantain chips and #chocolate syrup. 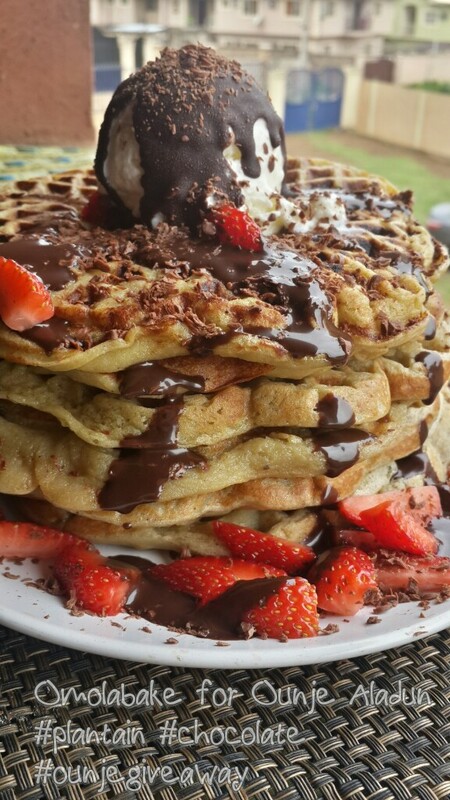 Plantain Waffles topped with frozen yogurt, chocolate syrup and shaved milk chocolate. Pictures of Chocolate bars that have been generously donated by The ChocBoy. Please follow them on Instagram and Facebook. 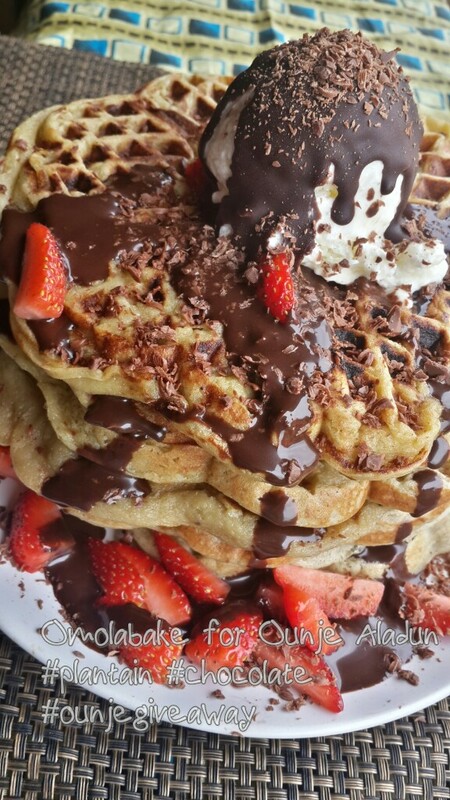 Visit www.chocboy.com for more information on the chocolatey treats they offer. 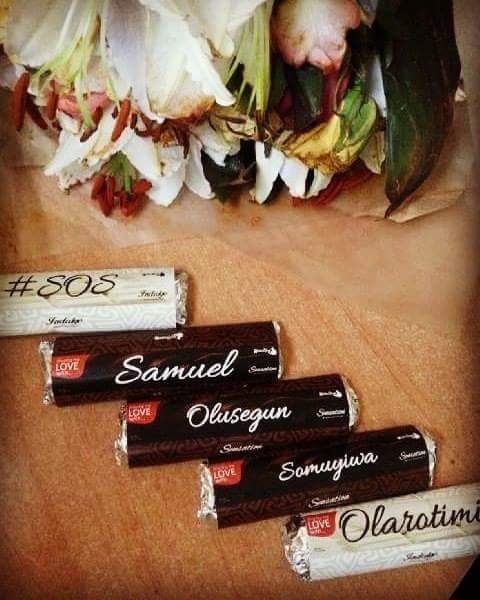 Customized Box of chocolates for that special person. 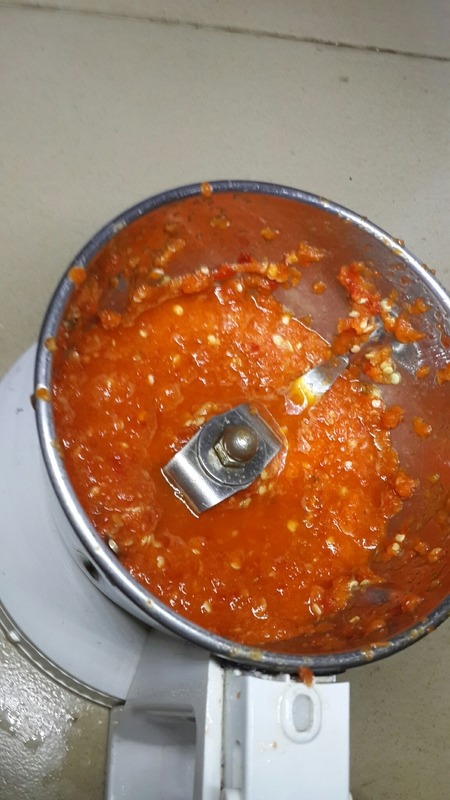 My sister came into the kitchen this morning as I was preparing to make garden egg sauce and she said, “Sis, isn’t this that sauce we hated as kids”. I told her, “Believe me, I now eat many of the things I hated as a child, so why not this one too”. Today probably is the first time I would eat Garden Egg sauce in probably 16 years. My husband on the other hand likes Garden Egg Sauce and for the 6 years we have been married, he has asked me several times to make it. My memories of garden egg sauce kept me from making it, well today I did and I loved it, so going forward I’d make new delicious memories of my own and share with my children. 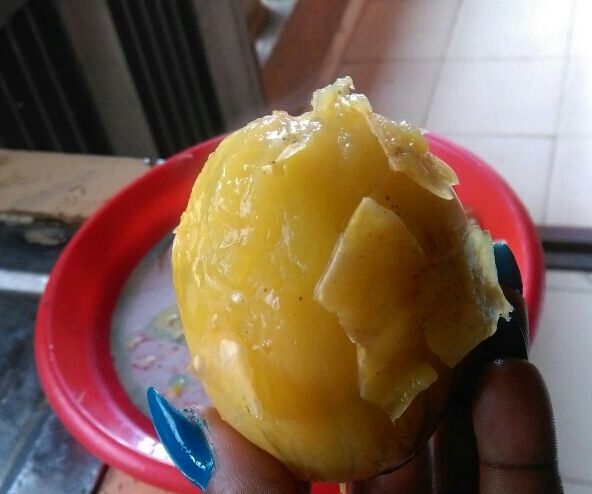 Douse the boiled garden egg in cold water so it is easier to peep the skin off. 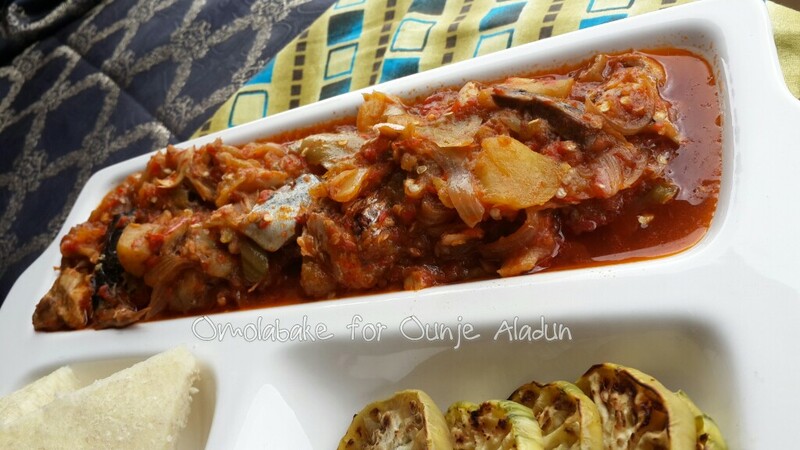 – Heat up vegetable oil in a pan, and add the onions. Fry the onions lightly and add blended tomatoes and pepper. – Add your seasonings, if you have stock, add a cup. 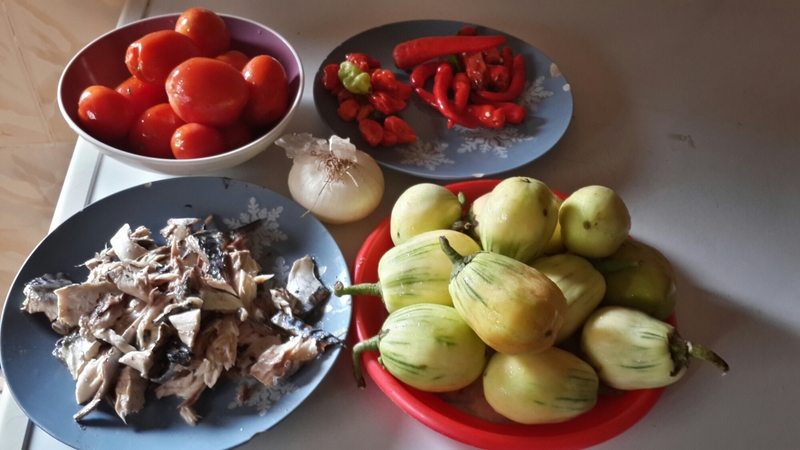 – When the pepper is cooked and the water has reduced completely, add the garden egg and the fish. Cook for an additional 7 – 10 minutes with the lid on. 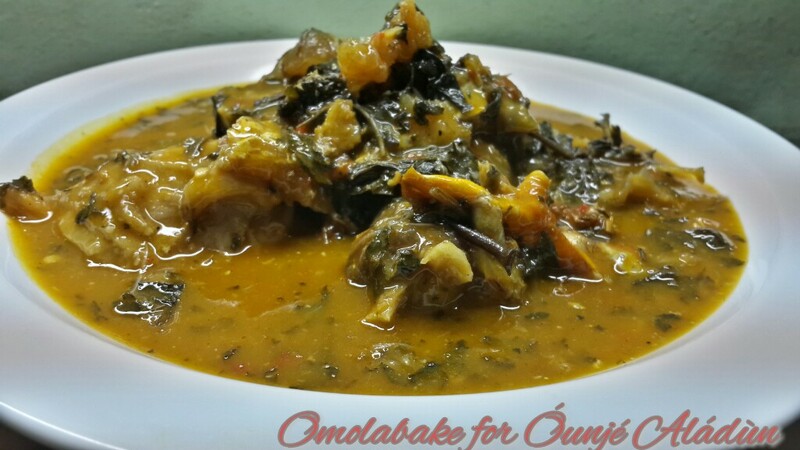 Garden Egg Sauce is most popularly served with boiled yam, you can pair it with anything you want. Serve warm. *the grilled garden eggs tastes good too. 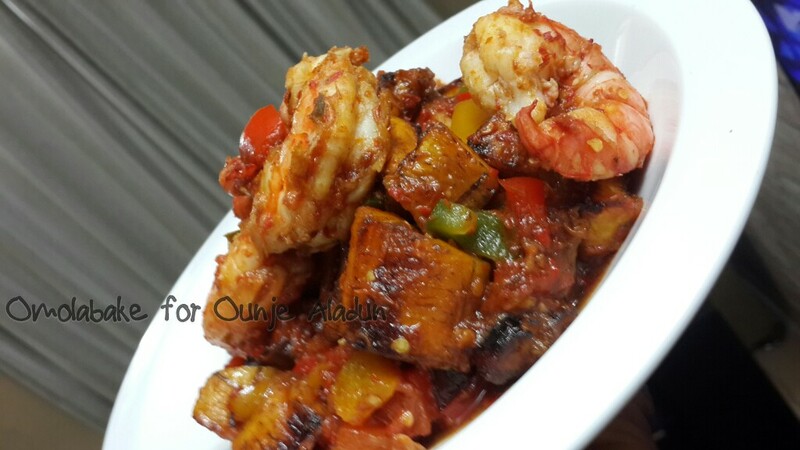 A few days ago, my Gizdodo was featured on a blog and it really cheered me up. Thing was I had been ill, drifting in and out of sleep from being heavily medicated with flu pills and antibiotics, I had initially thought it was malaria and so I self medicated (don’t be like me). That blog post reminded me a lot of a part of my life that I had not paid attention to at all this year. Cooking! Not just cooking, because of course I have cooked food this year, but being a mad scientist in my kitchen. Using my cooking as a therapeutic outlet and chronicling it. Not quite sure how I would fit this back into my life right now, but I’m sure I won’t let myself go too much to the extent that I’d neglect the things I love. 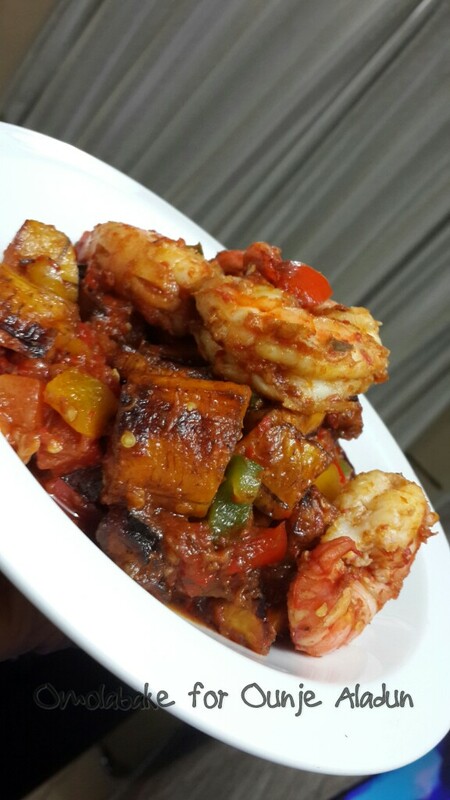 I love seafood as some people would know and this here is Prawn Dodo made using Gizdodo recipe. You should try it out. 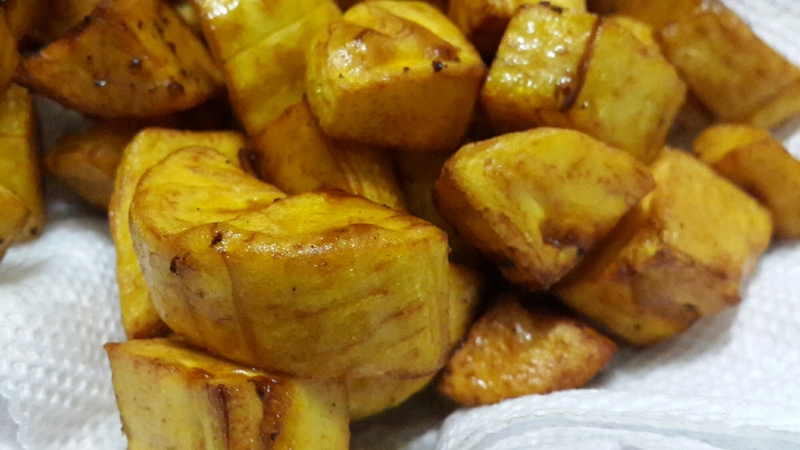 – Dice up your plantains and fry till golden brown and set aside. 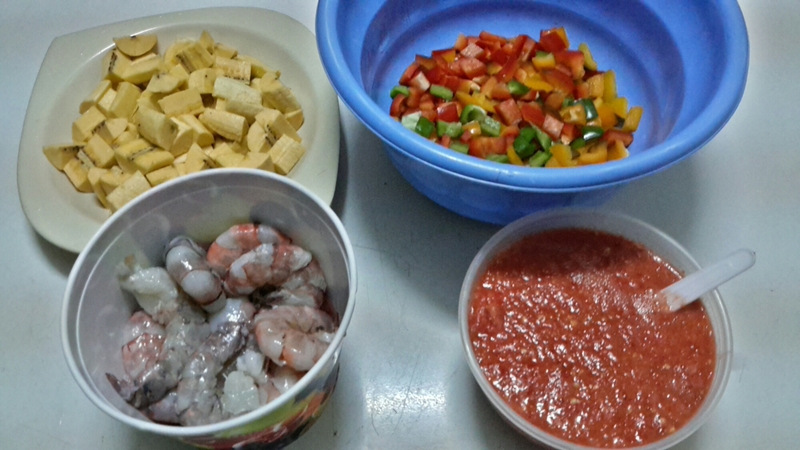 – Coarsely blend your tomatoes, onion and peppers. You can use as little or as much of any of these ingredients. What we want to get is at least 1 1/2 cups of the coarsely blended pepper. – Chop you bell peppers. 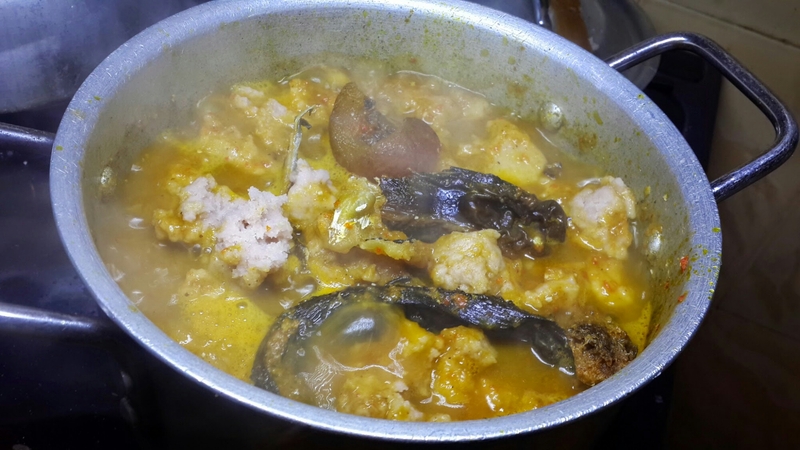 – In a pot or wok add coconut oil, blended pepper, add 1 cup of beef Stock, taste for seasoning, if necessary season a little more. 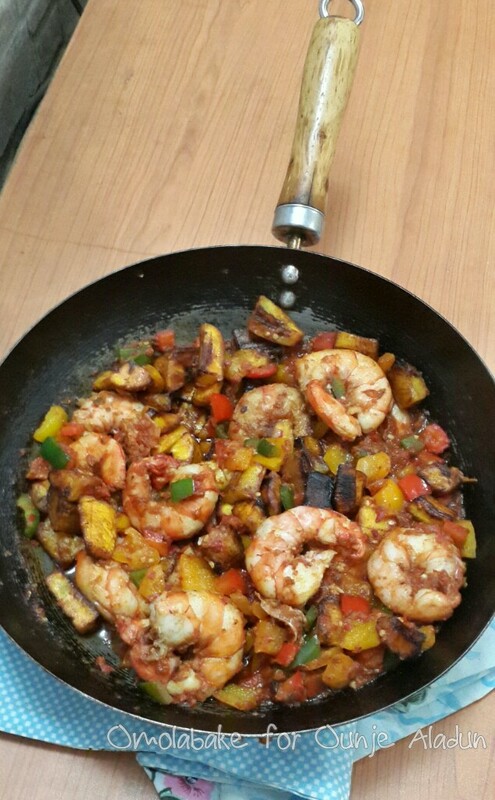 Cook with lid off till the water is reduced completely, turn the heat down a notch and allow the pepper simmer, then add chopped bell peppers and prawns. 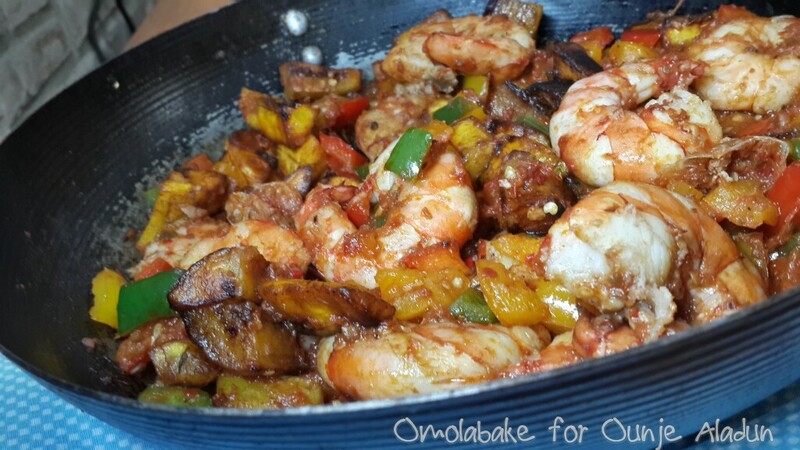 – Turn the heat down completely and cover the pot/wok for 2 minutes to allow the prawns cook, take off the lid and cook for an additional 5 minutes, then stir it in well and add the fried plantain and stir in using a wooden or plastic spoon/ladle so as not to mash up the plantain. 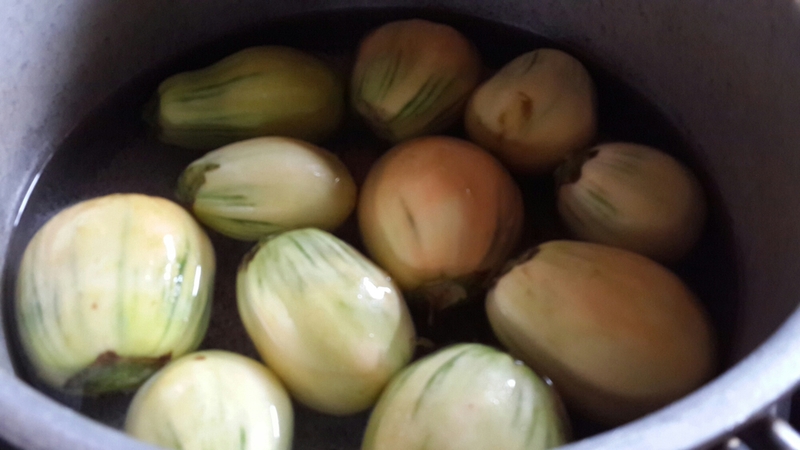 – Stir in well and turn off the heat. Serve warm. In recent times I’ve done very little “cooking”, most meals have consisted of quick fixes, take outs or otherwise cooked by someone else. I had a rough start this year. Thankfully it’s been rough for the right reasons, Growth in my business Fontaine De Vie. Shortage of man power, break down of some machinery welcomed the growth, it was a gruelling time because we just had to meet up. I went from a production staff strength of 5 to 1 coupled with no domestic staff to help with the home front, I found myself borrowing more hours from the next day only to fall short. It’s amazing how my health didn’t fail in all of this. I made it through and I’m grateful for the lessons I learnt during the phase. Challenges are made to strengthen you, it won’t break you if you don’t let it. 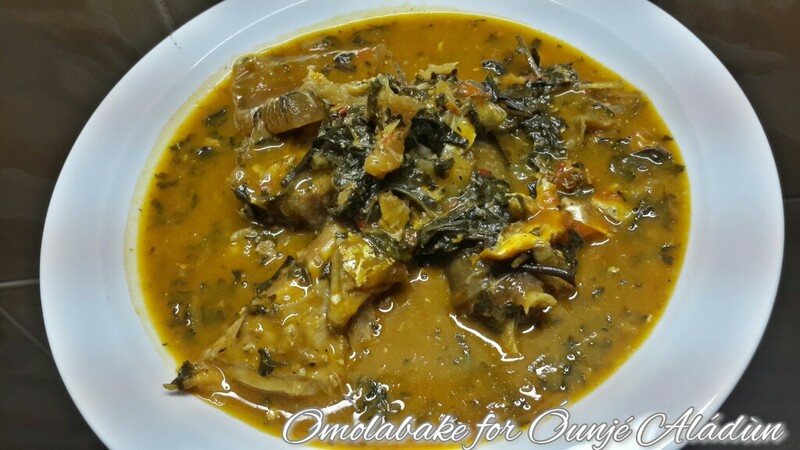 Ofe Onugbu recipe is the same as that of Oha, only difference is the leaves, Oha and Onugbu (Bitter Leaf). 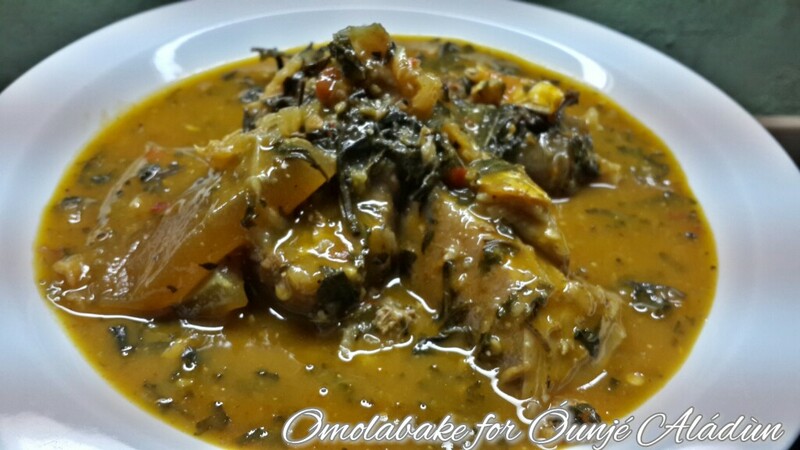 I’m a yoruba girl who loves to cook eastern and south eastern soups, a little more pepper than the traditional requirement and I’m good! – Grind pepper and set aside. 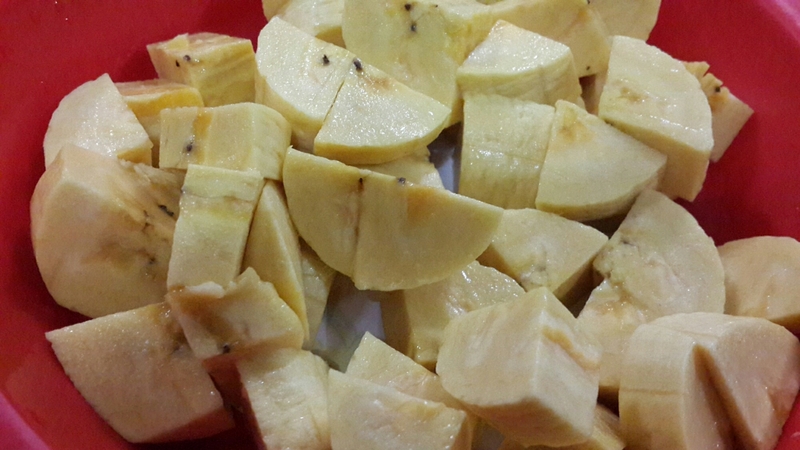 – Wash and boil the cocoyam corms till soft. 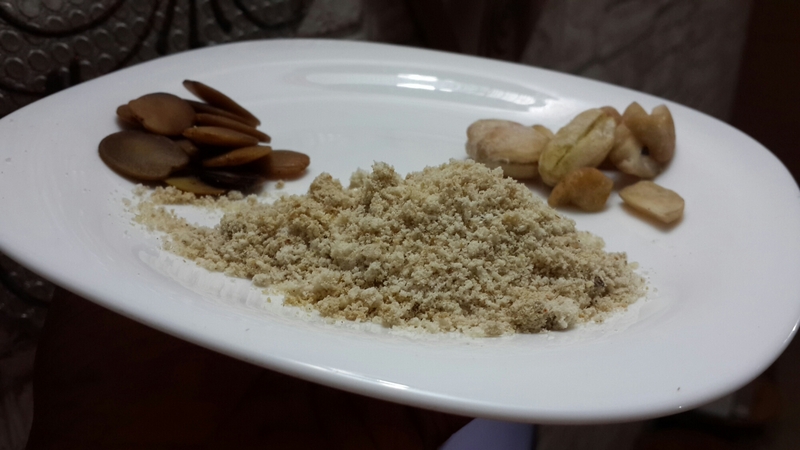 Remove the peels and in a blender , blend to a smooth paste you can also use a mortar and pestle , that is the more traditional approach. – Personally I buy, bitter leaves that have been washed in the market. However when I get home I pour boiling hot water over the bitter leaves and leave it steep for about a minute and strain, a friend advised I use salt to just wash it a little more instead of using hot water, to get rid of more of the bitterness. Now you may prefer to buy your own Bitter Leaf fresh , and wash from the scratch, I think it is tedious, but hey whatever rocks your boat. Set it aside. 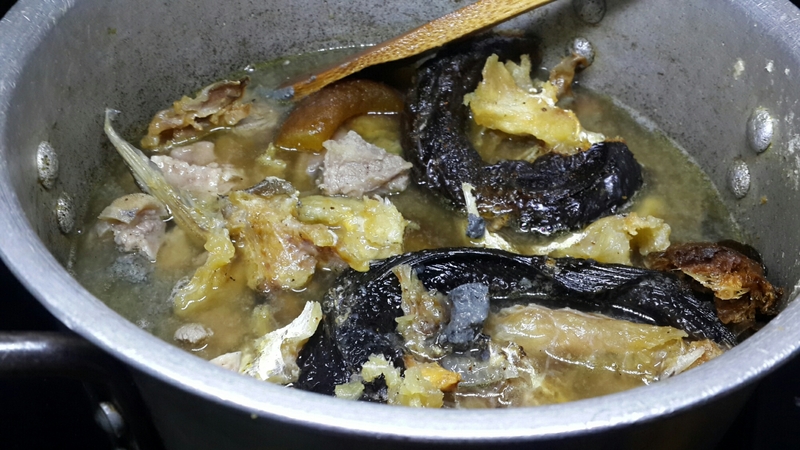 – Season and boil the meats, when then are tender add stock fish and dry fish. 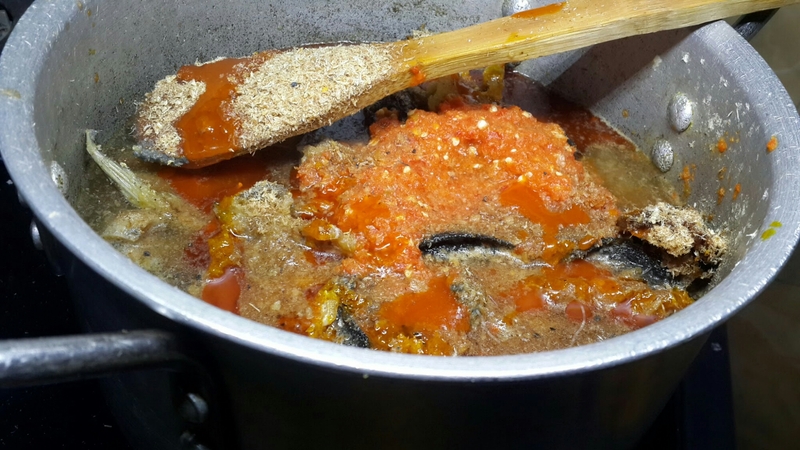 – Cover the pot and leave to cook on high heat till all the cocoyam lumps have dissolved. 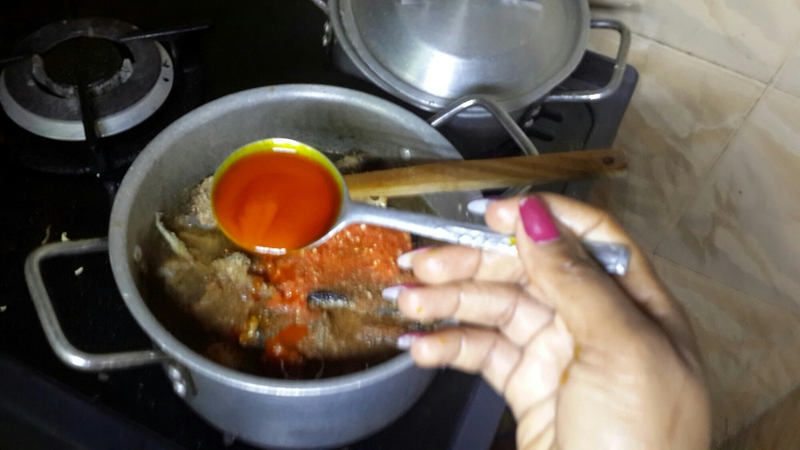 You can add more water if you feel that the soup is too thick. 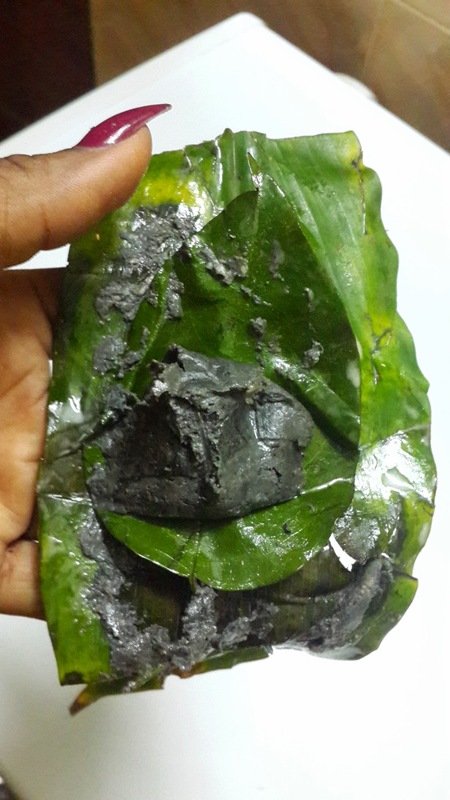 – Add the washed Onugbu (bitter) leaves and leave to cook for about 5 minutes. 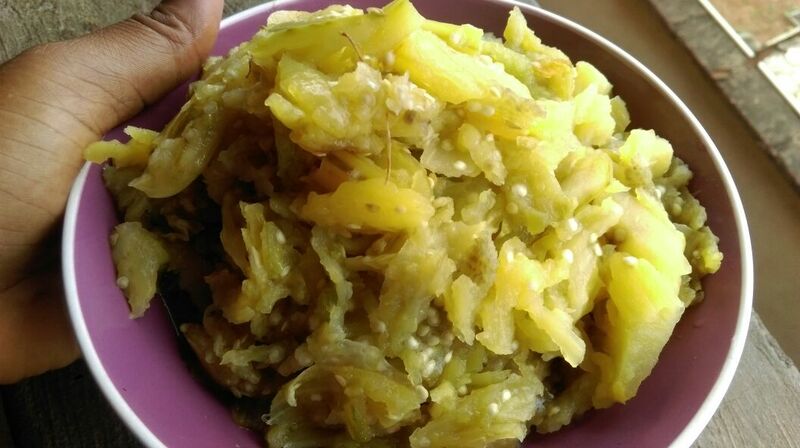 * Ever since the Igbo woman who sells me spices adviced I use a combination of Achi and Ofor instead of Cocoyam, I have come to fall in love with it. 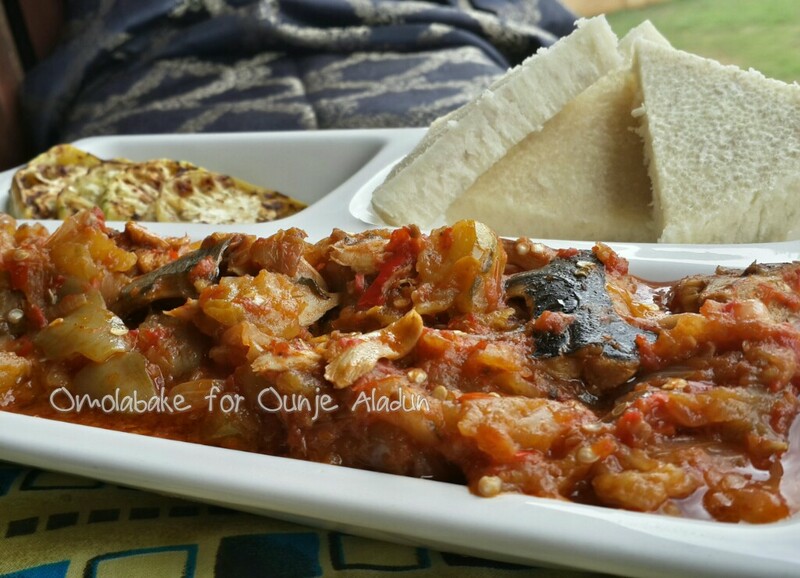 The smoothness, the consistency, the taste, is so different from what I get with cocoyam. I love it. Serve with your favourite starchy side dish. 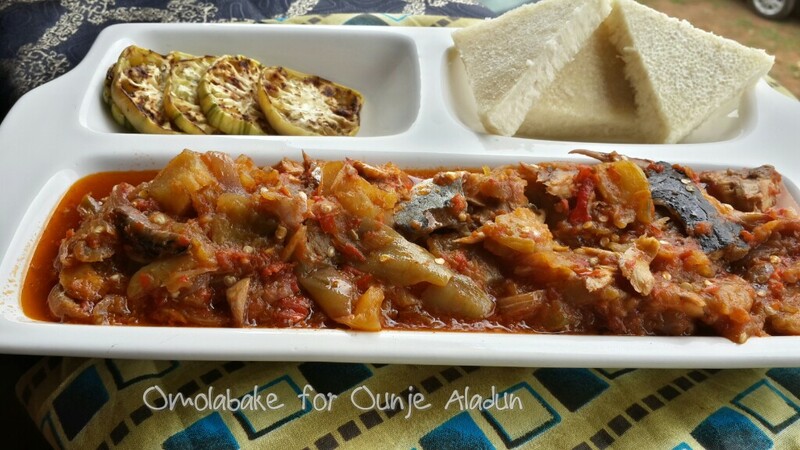 E.g Eba, Amala, Pounded Yam, even Rice.